Thank you to Smile Brilliant for sponsoring this post! All opinions are my own. I can barely even admit this, but I will be 40 very, very soon. FOURTY. Y'all, that just doesn't even seem possible. I remember going to a friend's 40th birthday party when I was in my 20's and I thought, man that dude is OLD. And, here I am. Apparently 40 is the new 30. Or at least that's what everyone is telling me. I think only people who are 40+ are staying it though! hahahaha! The lies we tell ourselves. It's amazing how you can just wake up one day and your body just starts falling apart. I have a bad hip, my knee hurts, I get shoulder pain...I sound like my grandmother! All of the aches and pains are starting to set in, and it's not fun, let me tell you! What is life going to be like in another 40 years? Along with that laundry list of ailments, I also have receding gums. This is something I haven't given much thought to, but my dentist recently advised that I need to start paying attention to the way I brush my teeth to avoid further deterioration. The more your gums recede, the more sensitive your teeth can be. If you have sensitive spots on your teeth, it may be a result of receding gums! My dentist advised an electric toothbrush is a better option than old fashioned brushing because it is usually more gentle than we are with our own wrist action. I was excited when Smile Brilliant reached out and asked if I wanted to try out their new electric toothbrush! 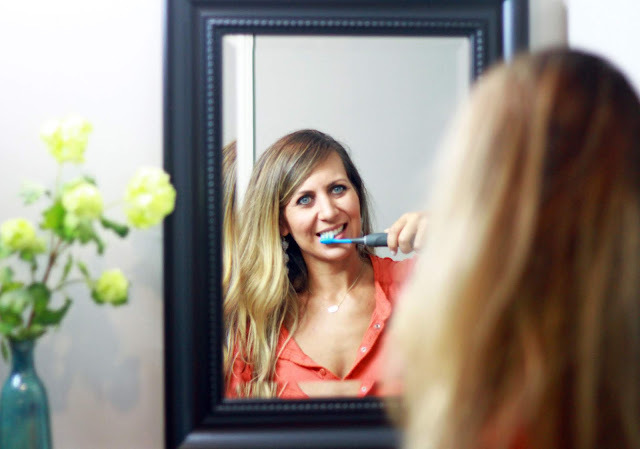 This company strives to provide quality oral care at an affordable price. 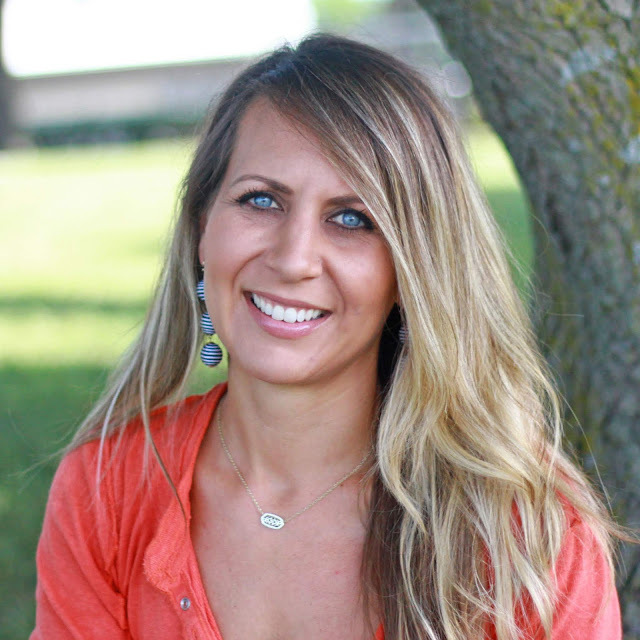 You may remember I had partnered with Smile Brilliant before, to share their teeth whitening systems, so I was thrilled to work with a company I have already come to love! The cariPRO electric toothbrush can be compared to the top of the line competitors, but at a much cheaper price (and I have a discount code for you at the end of this post!). It has 5 different settings, and I have been loving the sensitive setting! This is music to my receding gums' ears! I also appreciate the 2 minute timer with a slight pause at each 30 second interval. I tend to space out while I am brushing my teeth, thinking about a thousand things I need to do that day, or what I need from Target...and then before I know it I have been brushing the same spot for the past 4 minutes. Anyone else? The interval timer is a great reminder to move on to the other sections of my mouth, and to avoid over brushing. If you have never used an electric toothbrush, I can truly say they are 100% worth the investment. My teeth feel so fresh and clean after every single use. I love that I get ultra clean teeth without feeling like I have brushed too aggressively and hurt my gums. 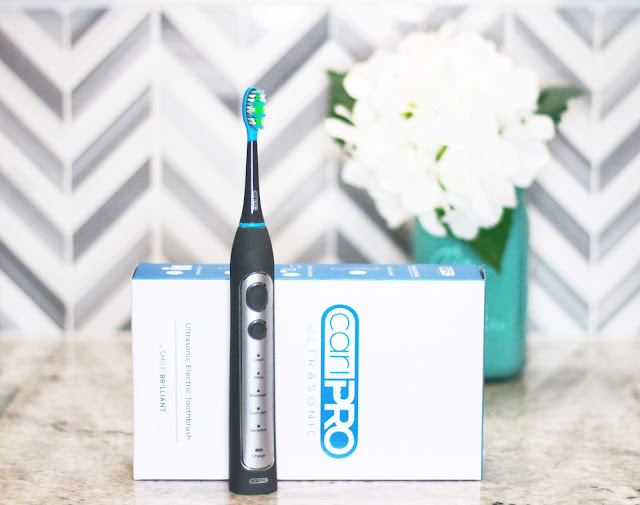 The bristles are soft and the settings are adjustable to fit your needs! So, now...the best part! 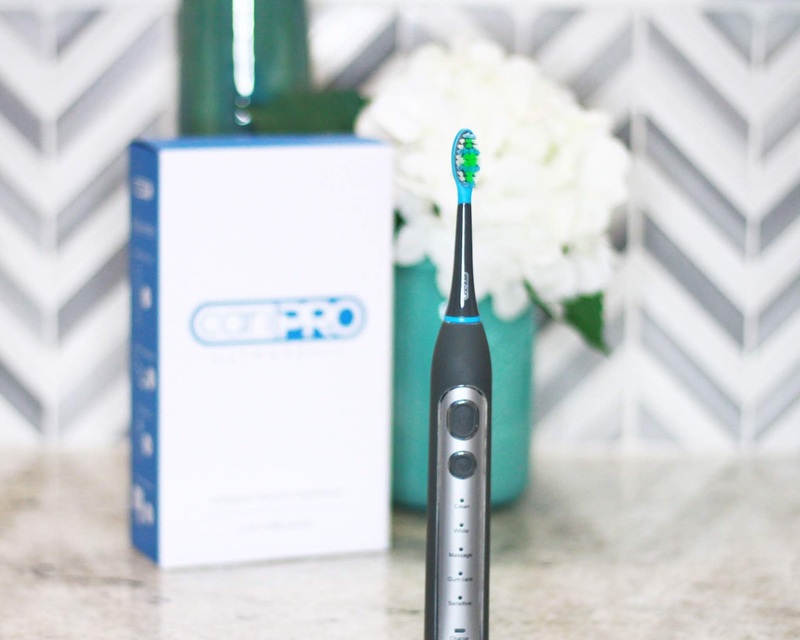 If you have been thinking about getting an electric toothbrush, now you can grab this one for 20% off and free shipping with code midwesternmama20. That brings the cost down under $100, which is less than half the cost of the leading competitor! You will get the toothbrush, charger, and 2 brush heads with built in tongue scrapers! And after the first time you use it, you will keep rolling your tongue over your smooth, clean teeth. I know from experience!